Single girder cranes are designed to cover a wide range of modern industrial demands, providing excellent value for money with no compromise on performance. A ROMACKcrane single girder crane has reduced wheel loads, saving costs on new support structures and increased lifting capacities on existing structures. 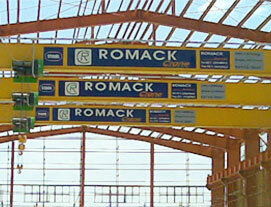 ROMACKcrane offers various crane beam to end carriage constructions to ensure optimum use of headroom available. Hoists are offered as standard in low headroom format running on the bottom flange of the beam. Hoist design ensures maximum cross bridge hook stroke with minimum side clearances.